So as you might know, I often help out with Amelia's attempts but I've yet to do one completely on my own. That part of my life is over now. Why? Because yesterday Amelia went down to Palm Springs and asked if I wanted to take the reigns on an attempt while she was gone. I begrudgingly accepted the challenge because a) I didn't have a choice and b) it would give me a forum to set the record straight about The Vivianne, which has resurfaced as a requested story due to the raspberry chocolate ice pops post. As far as the food goes, I ended up making a huge meal for Amelia's return on Sunday that we've opted to break into two separate posts. Welcome to part one: mini provolone popovers and The Vivianne. Follow me, if you dare. Note: Gourmet's are mini provolone popovers because they are baked in a mini muffin tin, but I'm a man and subsequently I don't own a mini muffin tin. I own a regular muffin tin. I bought an old oil painting at an antique warehouse in Wilmington, North Carolina and became obsessed with it. First there was the collection of ingredients. I picked this particular recipe because it is made of things that I like: butter, whole milk, eggs and lots and lots of cheese. These are also things that Amelia usually steers clear of whilst we try to eat healthy (sort of). Post-purchase, I convinced myself that the painting was extremely valuable. The only thing that was holding it back was the signature, which read (in what looked to be some manner of sharpie) Vivianne. My research indicated that Renoir never painted under that particular nom de' plume. I chopped up the provolone--remember, these are provolone popovers (aka provolone muffins?). I hit a brick wall on putting a value on my newly acquired masterpiece, and after several healthy debates as to whether the figure depicted was male or female, I did the unthinkable. I sent her/him away to my friend who appraises oil paintings at Sotheby's. This was unthinkable because it meant I would have to spend time away from Viv. I waited (waited = I began spending money against future Vivianne-related earnings). Remember all those ingredients from two pictures ago? This is what they look like all together. After an hour of waiting for the batter to chill, I spooned them into the regular muffin tin. Then, right before you put the tin in the oven you're supposed to close your eyes, bend your knees, spin around and whisper the word popover three times. Long story short: The Vivianne's estimated value was "whatever I paid for it." WTF kind of estimated value is that? Did you not check out that frame! Viva La Vivianne. Fortunately, I did NOT learn my lesson. I went treasure hunting at the same antique place a few months later and picked up "The Monk painting," which has a story with a decidedly happier ending. In fact, I'll tell ya all about it in part 2 of this post--it's awesome. Get excited. The popovers ruled. The recipe says to serve immediately. Tell me something I don't know, recipe. You'd be a total fool not to serve these immediately. Besides, when hot, there are little pockets of molten provolone and parmesan cheese. Mix that with the chives, the super rich dough, and you got yourself one hell of a popover popover popover. Stay tuned for Matt's attempt part 2! Whisk together milk, eggs, flour, 1 Tbsp butter, salt, and pepper until smooth, then stir in cheeses and chives. Chill 1 hour to allow batter to rest. Butter muffin pan with remaining Tbsp butter, then heat in oven until butter sizzles, about 2 minutes. COOKS’ NOTE: Batter can be made 1 day ahead and chilled. 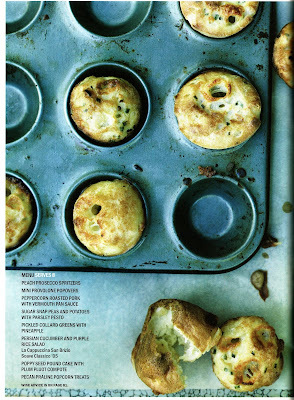 Oh man, the popovers look amazing. I'm totally adding them to my must try list. these were delicious & this post is hilarious!! i'm going to have to hand over the reigns more often--though I prefer my milk minus the hormones. hahaha, this post was SUPER hilarious! Can't wait to hear about the Monk painting, and I'm DEFINITELY making these. They look easy and amazing. I love this post, Mattbers. As I was reading about the popovers, I got excited about getting to the next bit of Vivianne storytelling. The Vivianne story added suspense to the recipe, which looks delicious!! what are the little reddish brown things? do you serve these with a side of scabs? lol. I want a picture of the monk painting in the follow up post. these popovers look yummy.